Along with the expected assortment of bird books for Christmas, I received a butterfly guide, specifically the National Audubon Society Field Guide to North American Butterflies. Readers of this blog know that I, like so many birders before me, am developing a growing interest in the invertebrate life I encounter in my travels. Dragonflies and butterflies pique my interest most, so this 928-page turtleback guide, with its 1,014 full-color photos, is well received. But is it any good? The first reason I ask this question is that I’ve come to appreciate illustrations over photographs in my field guides. Photos often fail to capture the marks or colors essential to identifying many birds. Perhaps they’d be more suitable for butterflies. My second initial concern was whether the Audubon guide would prove instructive enough. A great field guide should rise above the role of reference text and aspire to educate the user. The Audubon field guides to birds don’t succeed on that level as well as, say, the Sibley guides. Let’s consult the guide. This butterfly is predominantly chocolate brown with wings trimmed in a bold, ivory border. The blue spots are diagnostic, but don’t seem to be the primary identifying mark. The color plates in the Audubon Guide are divided into 15 distinct groups. Even with my limited knowledge of butterflies, I could immediately eliminate Eggs, Caterpillars, and Chrysalises. Only 14 groups to go! I did a quick flip in search of brown butterflies to no avail, so on to the next step. White Butterflies, Blue Butterflies, Eyespot Patterned Butterflies, Fritillaries, Checkered Butterlies, and Swallowtails could be ruled out, but I wasn’t so sure about some of the other categories. Sulphurs possess diaphanous wings ranging in color from pale white to orange. Our subject isn’t a sulphur. Skippers are closely reminiscent of moths. The Folded-winged Skippers look nothing like our subject, but the Spread-winged set had some close calls, even some butterflies with brown wings and white edges. However, skippers’ wings seem to all bear some sort of patterning, even the most cryptic ones. Our subject isn’t a skipper. Angle-winged Butterflies have sharply angled, somewhat irregular wings. Our subject is a bit ragged, but not angle-winged. Hairstreaks and Elfins are quite distinctive, with delicate patterns and thin, hairlike tails projecting from their hindwings. Metalmarks, which I’d never heard of before this, are named for the shiny metallic markings on their subtly patterned wings. Our subject is neither a hairstreak nor a metalmark. This process of elimination leaves us with two options. Copper Butterflies are more orange than brown, so they’re out. That leaves only the category of Boldly-patterned Butterflies. 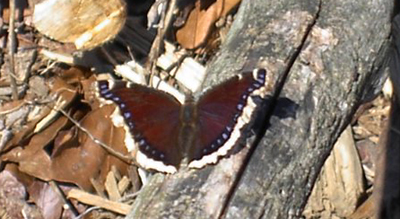 Lo and behold, there is our lovely subject, the Mourning Cloak (Nymphalis antiopa), rich brown-maroon with a ragged cream-yellow band bordered inwardly with brilliant blue spots. This brush-footed butterfly can be found throughout practically all of North America, so the location certainly fits. Last but not least, the guide states that this species is absolutely unique, so I can take comfort in the identification. There you have it. The National Audubon Society Field Guide to North American Butterflies works like a charm, and taught me quite a bit in the process. I’m looking forward to using this book more. My experience with the Audubon guides is that their texts are usually quite good, even where the photographs leave a bit to be desired. “Butterflies Through Binoculars” by Jeffrey Glassberg & The Kaufman Guide to Butterflies are both in my library…when they’re not in the filed with me. They are both excellent and I highly recommend both.